User instructions for track Data Manager can be downloaded from here. Help for installing track Data Manager for WINDOWS 7 you can be downloaded from here. 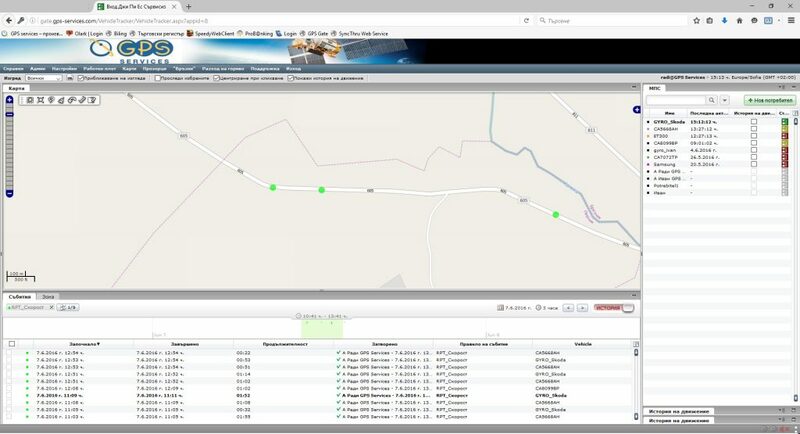 The application track Data Manager provides the full functionality of the client interface. Track Data Manager can be installed on a local (related to the server side during LAN) or remote (connected via the internet) workstations, and also it could work in different sessions on a terminal server (Microsoft Windows Server 2003/2008 32/64 bit). To control the access to the system by creating, modifying and deleting different user accounts with different rights to work. The access could be limited by functions, which users have the right to use, and by fleets to which the user has access. To configure different types of GPS devices, reflecting the different types of hardware used in the fleet. To configure different types of vehicles, reflecting the different configurations of sensors in mobile sets. To modify the data of vehicles in the system, and also to group them by parameters selected by user (e.g. by region-based, equipment licenses, etc.). The system of grouping is hierarchical with arbitrary depth, which allows the inclusion of a vehicle into several groups- this is very easy and appropriate way to filter vehicles in various reports. To monitor the current status of all vehicles or a few selected vehicles on the map. The map allows to change the scale (zoom-in and zoom-out), scrolling (scroll), searching for an object and selection a sheet. On the map, except vehicles also could be visualized stationary objects (e.g. garages, transformers, etc.) and defined areas (e.g. work areas for fleets). In an additional window can verify all the data derived from MC, including current readings of the sensors. The choice about displayed objects is set to filter by the user. To define stationary objects (points, e.g. garages, service stations, etc.) and areas (e.g. work areas) which will be displayed. If it is necessary to make an adjustment for the position or status of the entered stationary objects and areas, the user can easily make the correction. To follow the traces of the movement of a vehicle or a group of vehicles, selected on the map. The system allows visualization of up to 100 000 points in the history of movements of different vehicles at the same time. Vehicle groups and the period, for which the reference appears, are set by the user. To reproduce the movement and changes in the condition of the vehicle through simulation (manual or automatic); to visualize all data from any point on the path of movement; to generate reports for the period covering the time between two selected points of the path of movement. To send messages, inquiries and requests to the vehicle, including text messaging, telemetry applications (positioning), to send assignments or clarifications to the drivers.